Supermodel Naomi Campbell is back in South Africa and she is bringing smiles to children's faces. Over the years, Noami Campbell has stolen the hearts of many South Africans. The international model invests a lot of her time in our country. 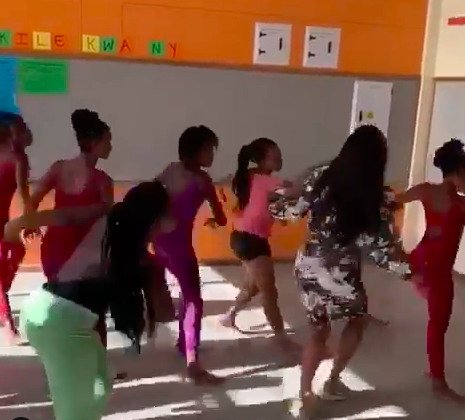 While in Cape Town, Campbell visited young girls at Marian RC Secondary School in Matroosfontein and danced with students at the Amoyo Performing Arts Foundation in Hout Bay. While on her visit, Campbell said: "South Africa is like my second home … it's given me so much, taught me so much and I want to give back to SA and Africa, the continent." Naomi shared some of the special moments on Instagram and Twitter. The beautiful afternoon spent with the young girls at the school brought smiles to many people's faces. Campbell thanked @femmeprojects for supporting this visit and bringing much needed sexual education to young girls in schools.